Unscrupulous fuel attendants and dealers have compounded a critical fuel supply situation that was caused by limited foreign currency reserves in the first place, investigations show. Fuel dealers and their service station employees are said to connive not to release all the fuel they get to the motoring public in order to sell it either to friends or to extort bribes from desperate motorists or to sell it on the black market at inflated prices through third parties. Amounts far higher than the technically required tank reserves are kept either for prepaid customers, US dollar buyers only or foreign embassies, The Herald discovered. Motorists who are prepared to pay a few extra dollars cash can fill their vehicle tanks. Most service stations limit amounts per customer to $40 or $50. Week long investigations by The Herald revealed fuel attendants and managers at most service stations demand up to $15 cash kickbacks for a full tank. Fuel attendants were also accused of giving preference to "loyal" customers who are allowed to fill jerry-cans and 220-litre metal drums, something the Government has warned against. At times, fuel suddenly runs out without any explanation given to queuing motorists. The practices were corroborated by motorists from different parts of the country. 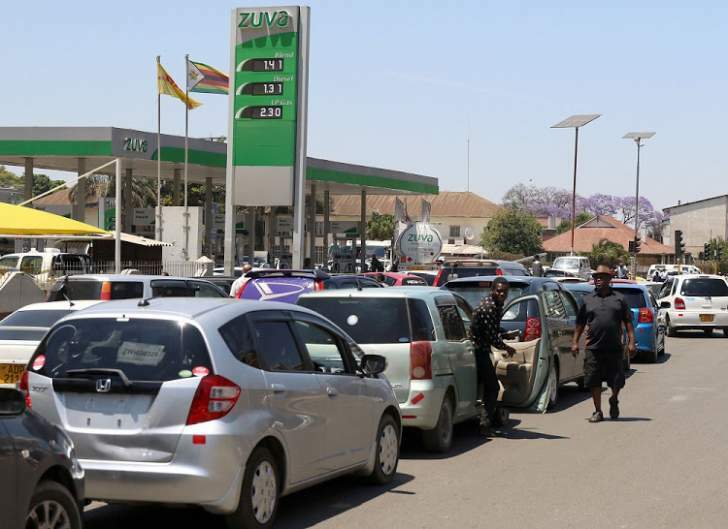 They implored Government agencies like the Zimbabwe Energy Regulatory Authority (Zera) and police to do random spot checks at service stations to expose the rot. "It is amazing that workers at (named service station) near Parliament Building say their pump is affected by hot weather and malfunctions but at night you see one or two cars fuelling," said a motorist, who identified himself as Mr Mafarachose. The same service station at Westgate in Harare, is said to rank among the worst performers, with its employees openly asking for bribes from motorists. During the investigations, this reporter witnessed first hand some of the assertions by motorists as he sought to buy fuel at major service stations around Harare. Energy and Power Development Minister Dr Joram Gumbo and Zera Acting CEO Mr Eddington Mazambani confirmed getting reports of corruption and other irregular behaviour by fuel dealers. Mr Mazambani however said it was difficult to prove an irregularity if a fuel service station claimed they were holding it for pre-paid customers. Minister Gumbo said; "We have heard of those reports but all that is dealt with by Zera and not the ministry. Call Mazambani; he is in charge of such issues. But Government policy is that fuel must be sold to everyone, including those with Bond notes and other payment platforms as announced by the Finance Minister (Professor Mthuli Ncube). "Prof Ncube said it's 1:1 (the value of Bond notes to the US dollar) and that is the money we are using at the moment. So no other policy has been made, only that people are mischievous and are rating the Bond (notes), causing unnecessary price disparities." Some service stations with obscure brand name openly demand between US$1 and US$1.05 per litre in cash, while Zuva Groombridge sells in foreign currency using Master cards. A fuel station at Musanhi Bus Company accepts Bonds notes only. All this happens on the back of most of the major fuel dealers receiving foreign currency at 1:1 with the Bond note for fuel procurement. Some are said to be so brazen that they have taken the hard currency to trade on the black market instead of purchasing fuel. Minister Gumbo has stated repeatedly that there are sufficient fuel stocks in the country but can't be drawn down due to lack of foreign currency. This has created room for rent-seeking behaviour by those with access to fuel or foreign currency. Dr Gumbo said Zera and the Zimbabwe Republic Police (ZRP) were on the ground looking out for unscrupulous fuel traders. "Zera and the ZRP are on the ground; they are going around the country checking at service stations to assess the quantum of fuel available and if it is not being sold, they discipline the service station concerned," he said. Mr Mazambani confirmed receiving similar complaints. "We have received similar complaints and we have been investigating them as and when they are made. It has been found that most service stations will be holding and selling fuel to pre-paid and account holders," he said. "There has been no evidence to date of fuel being withheld for customers who have paid bribes," he said. He said Zera would continue to monitor all fuel sites and investigate "any malpractices in the sector". Confederation of Zimbabwe Retailers (CZR) president Mr Denford Mutashu said he had been to some service stations in Graniteside, Harare, which refused to sell him fuel claiming it was reserved for prepaid customers yet some motorists just ahead of him had paid using the point of sale machine. "You will see a person arriving at a service station, they swipe and get a full tank and they will also have their plastic containers (not even jerry-cans) filled. But when you get to the pump they tell you the client has an account with them," said Mr Mutashu. "I think fuel is a national product which is procured through money put together by Government through the Reserve Bank of Zimbabwe so there should not be any entitlement, especially in a period of shortages like this," he said. "We should remove all those impediments and fuel must be accessed by anyone who arrives at a service station otherwise all those services where complaints are coming from should not be given allocations until they reform," he said. He said only fuel dealers with the "national interest at heart, who sell unconditionally", should be allocated foreign currency. Mutare police recently apprehended five illegal fuel dealers and recovered 2 000 litres of diesel and petrol, which had allegedly been corruptly obtained from service stations. Police in the border city are now targeting service station managers to clamp down on the vice. Reports also suggested a manager at a major service station in Zengeza 4, Chitungwiza, was recently forced to serve clients on his own amid corruption allegations against his subordinates. Zuva CEO Mr Bethwell Gumbo could not comment as the was not picking up his mobile phone while Total Zimbabwe managing director Mr Ronan Bescond's mobile was unreachable. Meanwhile, some service stations refuse to sell fuel in areas with high temperatures claiming "it is unsafe" to do so. However, motorists are later told that fuel has run out even when they never saw it being sold. Mr Mazambani said cases of service stations failing to sell fuel because of temperatures depended on the "type of pumps used" and the distance from the suction to the discharge point. He said sites with "suction type pumps" are vulnerable to vapour lock during very hot weather while those with submersible pumps are not affected.